In a medium bowl, whisk together the flour, cocoa powder, baking soda, ginger, cinnamon, cloves, nutmeg, allspice and salt, then set aside for a moment. Place the butter and both sugars in the large bowl of a stand mixer fitted with a paddle attachment. Beat them together on medium speed until light and fluffy, about 1 minute. Add the molasses, egg, vanilla extract and orange zest, and beat until well-mixed. The mixture might look a little broken at this point. Stop the mixer and add the dry ingredients. Mix on low speed until just a few streaks of flour remain. Finish mixing by hand, scraping the bottom and sides of the bowl well with a spatula. Turn the dough out onto a piece of cling wrap and wrap it well. Chill for at least 2 hours, preferably overnight. Preheat the oven to 350 degrees. Pour some granulated sugar into a shallow bowl. Roll the chilled cookie dough into small 1-inch balls, roll the balls in granulated sugar, and place them 2 inches apart on a parchment-lined baking sheet. Bake for 7-8 minutes until puffed and dry in the center, but still soft. 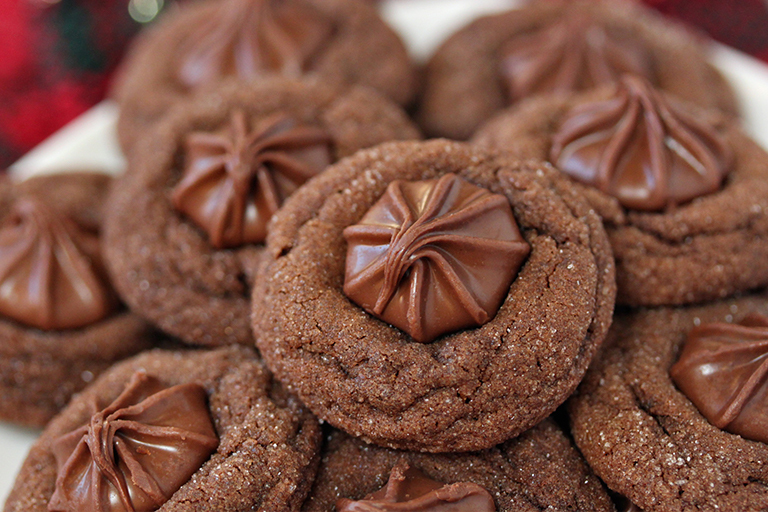 Remove baking sheet from the oven and immediately press a chocolate star or unwrapped chocolate kiss into the center of each cookie. Let them cool completely on the baking sheet. These cookies keep amazingly well and, if stored in an airtight container at room temperature, will be soft and moist for up to a week after baking.